" We breathe life and longevity into your vision." 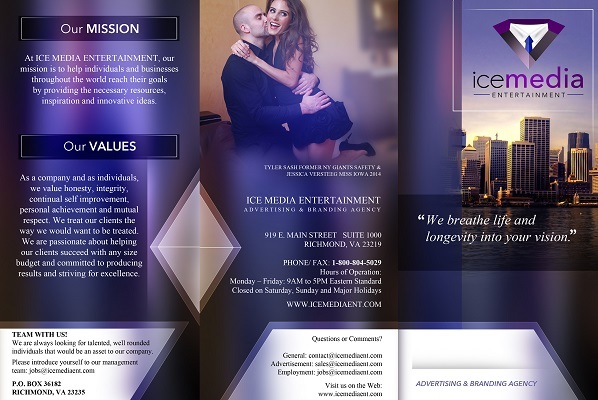 ICE MEDIA ENTERTAINMENT is a global Advertising and Branding Agency with locations in DC and New York and our headquarters is in Richmond, VA. As a full service advertising agency, we offer two media outlets in the form of radio and magazine. A portion of these proceeds will benefit The ALS Association in loving memory of our Founder's father, a Veteran, who lost his battle with ALS in 2006. Our mission is to help individuals and businesses throughout the world reach their goals by providing the necessary resources, inspiration and innovative ideas. We are passionate about helping our clients succeed with any size budget and committed to producing results and striving for excellence. As a company and as individuals, we value honesty, integrity, continual self improvement, personal achievement and mutual respect. We treat our clients the way we would want to be treated. We can create the perfect advertisement solution for your business. As your Personal Catalyst, we put together the right combination of services for your specific needs and goals. Download a copy of our company brochure. We have helped clients throughout the US, Canada, UK, Germany and Australia. With offices in DC, NY and VA.
We write content and articles for your projects, press releases, corporate bios, media kits, ad campaigns and websites. Our Projects include: article features, branding, promotions, social media marketing, event coordination and digital design. Our Management Team has several years of experience in business start-ups, public relations, marketing and entertainment. Career and Lifestyle magazine for today's woman.